- Showers: Although sonic showers are standard fixtures on all Federation starships, Senior Officers on board Scarab-Class Cruisers such as the USS ANUBIS have access to both water and sonic showers. This feature was part of the initial design concept from Admiral C. Koniki, claiming that this would help keep the Senior Officer's morale up during extended undercover missions. No actual water containment systems are used, so the water is "replicated" at the mouth of the shower head (at whatever temperature has been requested) and immediately recycled upon doing into the "drain". This insures that no wastes are created and that the energy expenditure is kept to a strict minimum. - Holodecks: To help in times of extreme needs, or in the case of a catastrophic system's failure, Holodecks 3, 4, 5 & 6 on board all Scarab-Class Cruisers have an independent power supply and computer processor, allowing them to function even when main power and/or the main computer is down. This was designed to permit the creation of specialized areas, such as additional Sickbays to assist should such areas be inaccessible or unable to operate as intended for whatever reason. The SCARAB-Class is a specialized Nebula-class starship that was commissioned by SFI, its primary mission profile being long range Intelligence gathering, an area that the Federation has found itself lacking in the last few years. The SCARAB-class was designed to be completely self-sustaining, allowing it to achieve mission objective without having to rely on the proximity of a starbase or support vessels. Although built with an impressive offensive and defensive weapons' array, the SCARAB-Class is primarily designed to avoid detection and escape with the least amount of damage. Sensor blocking fields and ablative armour are only two of the ways this is achieved. Should more serious problems be encountered, the SCARAB-class is more than capable of defending itself without relying on backup or assistance, which would be more than likely, unable to reach them in time. On the outside the SCARAB-Class vessels appears like any other Nebula-Class starship with the exception of the naming system. The Egyptian Deity names used for the three vessels identify them, to those who know what to look for, as the Intel ship they are. Dampening fields are present all over the ship in order to mask its power signature, which would identify it as being heavier and more powerful than a standard Nebula-Class cruiser. Directly based on standard holodeck technology, the simulation chambers are designed to provide any infiltration team with a perfect replica of the area they will be faced with. Directly linked to the planetary sensor array, the simulation chambers have the ability to provide a life-size training area with real-time feed from the sensors, thus allowing the training group to interact with events as they are picked up by the sensors. Of course the simulation is limited to exterior scenarios only, but the ability to train in a perfect replica of a target zone far outweighs any limitations this system might have at this time. 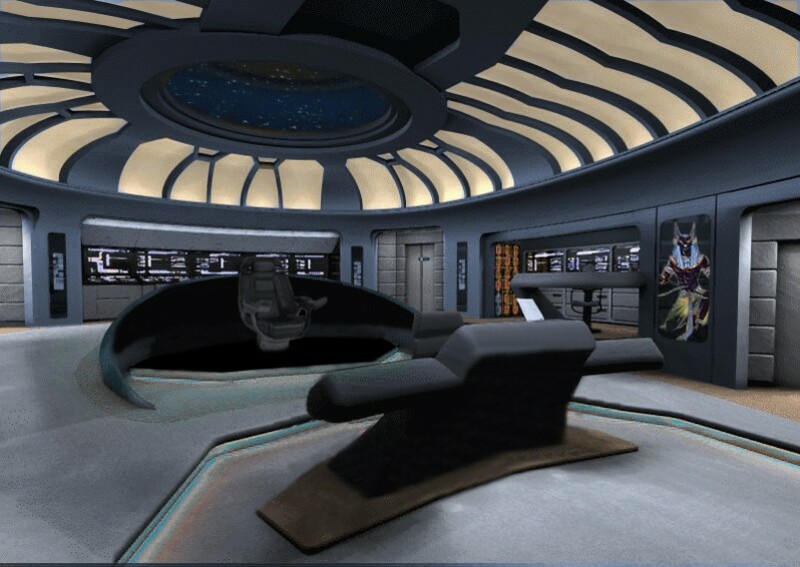 The chambers are set to be much larger than a standard holodeck to as to free up the computer's power to deal with moving variable instead of adapting the simulation to the movements of the training group. A 2500 meter squared area can be reproduced in each of the chambers, allowing up to 2 groups to train simultaneously on the same or different scenarios. These were added to the SCARAB-Class' arsenal to provide the vessel with the ability to overwhelm and destroy blockades that might be placed in its path during a retreat. Specially modulated so as to not be identified as being of Federation origin, the four pulse canons have one major setback... that of being immovable, firing in a direct line along the ship's X-Axis. Adapted with a biological agent that reduces the effectiveness of outside sensors, the Bio-Regenerative Hull Matrix allows the SCARAB-Class to self repair minor damages to its hull while at the same time provide a basic protection from external scans. The key system of the SCARAB-Class vessel is the Ablative Armour or Ablative Cloak as SFI engineers who developed it have referred it to. The armour is designed to offer the vessel the means to enter planetary systems without being detected, the armour possessing sensor-deflecting properties. In addition to this, the armour was given a pitch-black colour to allow the ship to be less visible to direct observers. This would in theory enable a SCARAB-Class vessel to remain undetected while in orbit, being invisible to radars / sensors and appearing as a black shape to an observer. The advantage of this system is that no ion displacement is created, as per a Romulan or Klingon cloaking device, but the obvious draw back is that the ship would be easily noticeable should the observer be within a few hundred kilometres, the vessel effectively hiding anything that would be behind it from the observer's point of view. Used in addition to the standard shields, this system is designed to force the dispersion of any energy directed towards the ship before actually impacting against the ship's defensive screens or ablative armour. In the majority of cases this system greatly reduces the power of an energy weapon. The EDC has an added advantage of disrupting external sensor locks making the SCARAB-Class vessel that much harder to be found by general sensor sweeps and by directed targeted weapon systems. 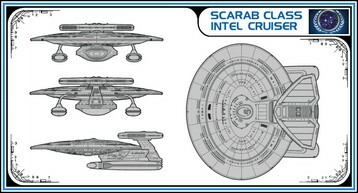 In order to facilitate the work of the away team, and considering that the resources of the ship may not always be available, the SCARAB-Class has been equipped with four types of special crafts to assist in the achievement of all mission objectives. These two-man fighters have been designed to operate both as atmospheric fighters and orbital escorts. Limited in range, the Viper-Class interceptor are meant to provide air support to ground troops or to reach areas where the SCARAB-Class cannot go. In order to avoid being recognized as of Federation origin, the fighters were given a very distinct appearance, very different from what is usually encountered within the Federation and its allies. Even the flight interface was altered, using old style "joystick" control systems along side a direct mind-to-computer interface allowing the ship to respond to its pilot's thoughts. Like the ANUBIS, the Viper-Class Interceptors have been equipped with a bio-regenerative hull matrix. Although much weaker than that of the SCARAB-Class Cruiser, the hull matrix for the interceptors possesses an additional ability, that of changing colour as needed. This allows the small craft to blend in far better in its environment, allowing it to go from pitch black for night-time flights to sky-blue for day-time. These three-passenger large four-wheel drive personnel carries are designed to provide an away team with the means to travel swiftly from one location to another without having to rely on the vessel's transporter which might give away their position as well as the ship's own presence. Equipped with an ultra quiet solid-state engine as well as a basic holographic camouflage system, the Locus-Class land rover is able to appear as almost anything in it's surrounding both when motionless or moving. Designed as a basic command post, the Barracuda-class MCU offers an away team with the means to use planetary water systems as a way to hide and move. Equipped with only the basic of medical facilities and rest areas, this MCU is able to carry 1 Locus-Class land rover as well as a total of 30 Marines in addition to the standard 10 members of a Command Team. The Barracuda-Class MCU is also capable of limited flight capabilities, allowing it to travel from the ship to a planet's lakes or ocean and effect a single return trip. Like the Barracuda-class MCU, the Sphinx-Class MCU is designed to provide an infiltration team of up to 8 individuals with a basic base of operation while away from the ship. Equipped with the same basic holographic camouflage technology as the Locus-class rovers, the Sphinx-Class MCU possesses basic medical facilities and rest area while also offering an away team with an extensive sensors and communications monitoring system. The Sphinx-Class MCU is capable of rapid ground movement as well as limited flight capabilities, allowing it to travel from the ship to a planet's surface and effect a single return trip. "The price for peace is eternal vigilance." The SCARAB-Class vessels are each equipped with a single specially constructed Avatar, an android possessing complete access to all of the vessel's systems. This permits the crew to verbally and physically interact with the ship in a ways never imaged before. It also allows for an away team to stay in direct contact with the ship and all of its systems as the Avatar remains in contact through a secured sub-space, multi-layered, quantum encoded channel, with the ship's core processor. The range of this remote access can go as far as 500,000 Kilometers, which is more than enough to stay in contact with a ship in standard planetary high orbit of 35,000 to 40,000 Kilometers. 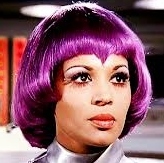 The core frame of the Avatar was constructed using techniques developed from the exchange of information with the Cytherians over 50 years ago. Built using a super high density poly-carbonate alloy, the Avatar is capable of functioning in the most extreme environments ranging in temperatures from 150 Kelvin (-123 Celsius) to 425 Kelvin (151 Celsius). The robust nature of this alloy also allows the Avatar to function without any discernible difficulties in a gravity ranging from 0.25Gs to 14Gs as well as in atmospheric pressures ranging from negative 2 to 5.125 atmospheres. Due to the high durability of this alloy, the frame of the Avatar is able to withstand high velocity physical impacts without leaving any traces. Designed to protect all primary systems, this revolutionary frame grants the Avatar the ability to ward of most physical and energy-based attacks. The life-like skin of the Avatar possesses limited bio-regenerative capabilities, allowing for the `skin`to repair itself when damaged. Beyond this, the Avatar`s modular construction allows for many of her external components to be simply removed and replaced when required. 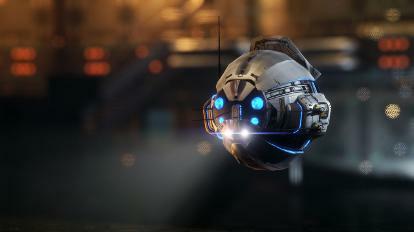 Not actually possessing an independent processor, the ship's Avatar is completely dependent on the vessel's main computer. This has the advantage of granting the Avatar complete access to all information available to the ship's computer. Unfortunately it also presents the Avatar with a weakness that can see it become useless when the main computer, for one reason or another, goes off-line. The Avatar for the USS ANUBIS is referred to as ANI. A special dedicated file system had been created within the computer core allowing her to interact with more personality with each member of the crew. This interaction though is still very limited as many of the normal interpersonal behaviours are unknown or incomprehensible to the Avatar. There Dynamic Remote Operated Nanotech Explorers are small devices controlled by the ship's Avatar in order to permit her, while off the ship, to increase her surveillance and scanning range. Measuring 3.5 centimeters in diameter, these small spherical robots and nothing more than a collection of remote, short-range sensors and scanner remotely operated by the ship's Avatar. Their primary goal is to offer the away team a safer way to gather information or to access areas where it would be impossible for a member of the crew to go.